wagon has a capacity to carry 3000- 3500 tonnes. To make it viable the barge has to have at least a capacity of 2000 tonnes and if there a navigable channel that can accommodate at least two such vessels at a time, then it becomes extremely economical and with large volumes of such traffic IWT will be quite viable. But the problem is that to move a vessel of about 2000 DWT a Least Available Depth (LAD) of 3m is required in the lean seasons. During the monsoon, there is no problem since the depth goes up to about 15m. But this is not available on all the stretches. For example, on the NW1 in the Ganga, going upstream from Haldia to Farraka, there is an available depth of 3m, which is quite good. From Farakka to Bar, near Patna, the depth goes down to about 2.5m, from Bar to Ghazipur, towards Varanasi, the depth decreases further to 2m and beyond Varanasi up to Allahabad the depth goes down below, up to 1.5-1.8m. This situation is not so good for navigation of large barges. This is one of the principal aims of the Jal Marg Vikas project – to have a LAD of 3m throughout the 1,600km NW1 from Haldia to Allahabad. Also, we need a channel with an minimum width of about 45m. Once the LAD and minimum width is implemented throughout NW1 then large vessels can easily move about. The second limitation is the night navigation system. This is available only on some stretches, on most NW1 stretches they are not yet been installed. Therefore the barges and other vessels on the Ganga operate only during the day and are anchored during the night. For an assured mode of navigation that is operational 24 hours night navigation is required throughout the length of NW1. As of now, night navigation is available on the Haldia – Farakka stretch, this has to be made available throughout the entire NW1 stretch. The mandate of IWAI was to maintain the rivers which has been done…. but now the emphasis is on river navigation and movement of heavy cargo. This requires a paradigm shift: a revisiting of objectives, transport economics, development of fairways, development of business strategy etc. Eventually, in course of time, once the project is operational and we have about 150-200 vessels moving across the NW1 a River Information Services system, Automatic Identification System and DGPS for accurate information about the vessels which will ensure safe navigation. Then there is a need for more terminals where barges can berth, refuel etc. 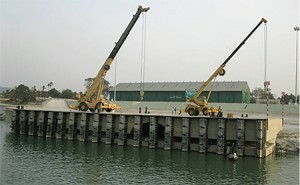 There is also need of dockways and slipways where barges can be provided repair and maintenance facilities. An important point is that the mandate of IWAI was to maintain the rivers which has been done through dredging, river draining and river conservancy, but now the emphasis is on river navigation and movement of heavy cargo. This requires a paradigm shift: a revisiting of objectives, transport economics, development of fairways, development of business strategy etc. Various studies have shown that freight traffic will grow by about 50-60% over the next 20-30 years. There is a limit to how many railway lines can be laid and how many roads can be built to meet this demand. Similar improvements are being planned on NW2 and NW3 also. Perhaps this is the first time since the inception of IWAI that such a project on creating capacity for navigation for large scale use in inland waterways is being implemented.